Do you like to eat the same thing everyday for breakfast or switch things up? I guess I am a mix of both. I can go days on end eating oatmeal everyday, especially during winter. In the summer, I like a bit more variety. I woke up a bit early the other day and decided to make something a bit different for us. 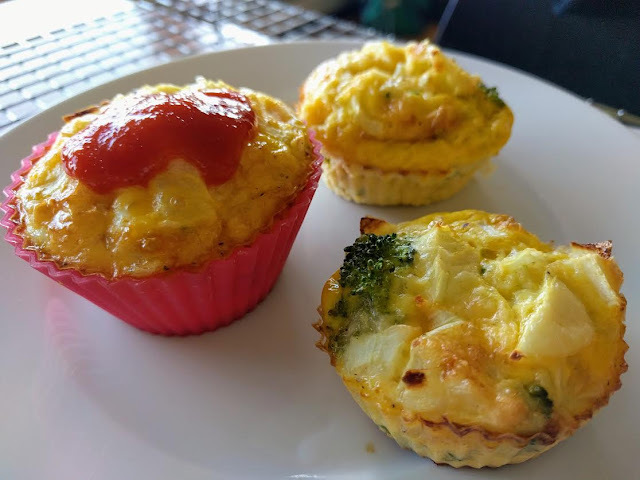 The great thing about these egg muffins are that you can throw in whatever ingredients you have on hand. Also, they are great for breakfast on the go. Here I used broccoli, onion and cheddar but anything would work. It was funny to see Stefan when he woke up. He saw an empty bowl where the eggs had been, but nothing was on the stove... hmmm. It was sweet and funny to see him try and guess and figure out what I was making. I will definitely make these again. - any veggie you want. It might have been good to fry up the veggies first, but you don't have to.